Medicare eligibility begins for most people at age 65. 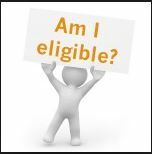 If you have been entitled to Social Security disability for at least 24 months then you may qualify for Medicare benefits as well. Everyone who has worked at least 40 quarters (10 years) in the United States during their lifetime can qualify for Medicare at age 65. You are eligible for Medicare Part A at age 65 if you or your spouse has legally worked for at least 10 years in the U.S. (40 Quarters). During those years, you paid taxes toward your Part A hospital benefits. This is why most Americans pay no Part A premiums when they become eligible for Medicare. If you have not worked the required 10 years, Part A may be available for you to purchase. Contact Social Security to find out the exact cost you will be required to pay. If you have to purchase Medicare Part A the monthly cost in 2019 is $437. In some cases, however, there are partial premiums for people who have worked 30 to 39 quarters and will be required to pay $240 for Medicare Part A coverage. You are eligible for Medicare Part B at age 65 as well. However, you must pay a monthly premium for Part B. This provides for your outpatient benefits such as doctor visits, lab work, surgery fees, and more. Some people turning 65 still have health through an employer. They can delay their enrollment into Part B in favor of their group health insurance without fearing a late penalty. If you delay enrollment into Part B, consult with an insurance agent who specializes in Medicare. He or she can explain the special election periods which you must use later on so that you won’t be subject to a late enrollment penalty. Determining your Medicare eligibility is sometimes tricky. We get many questions about how to qualify, when to enroll in Medicare, and how to set up Medicare supplement insurance. Though the process may seem overwhelming to you, our experts deal with these processes every day. We can guide you easily through the process.